An inter-cultural festival grows deep in the desert. Something like it is mooted for Alice Springs. What can we learn from our northern neighbours? 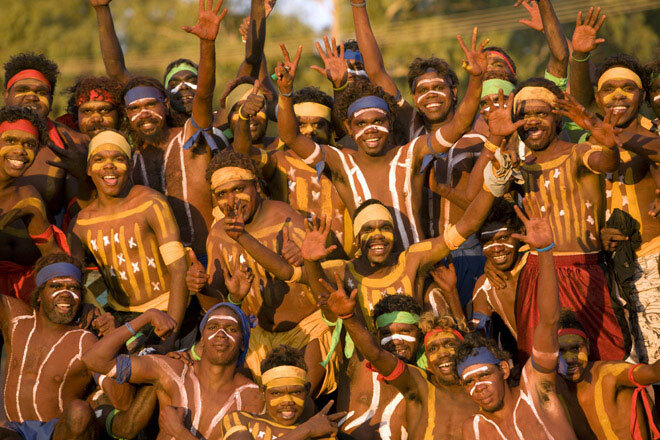 ‘They’ are the participants in the Milpirri Festival whose fourth manifestation will be staged at Lajamanu, in the northern reaches of the Tanami Desert, halfway between Alice Springs and Darwin, in October this year. 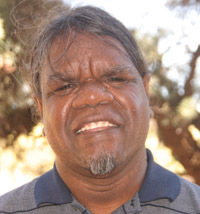 Speaking was the festival’s artistic director, Steve Patrick Jampijinpa (pictured), a son of the community and a former school teacher there, now a research fellow at the Australian National University. Mr Patrick gave the keynote address at this week’s forum on experimentation and innovation in desert arts. The motto of the festival is “speak to the land, the land will speak back”, he said. The next image he invoked (that I caught from his softly spoken speech delivered as a string of beautiful metaphors) was of “hot air rising, cold air falling” – a metaphor for coming together, possibly in a thunderhead – a “voluminous cloud full of fury”. In coming together “there’ll always be a bit of a rough time” but out of the clouds comes “life-giving rain”. That rain has grown the festival, a joint effort of the community and the Darwin-based Tracks Dance Company which has been working with the Warlpiri people of Lajamanu since 1988. So Milpirri is “an inter-cultural venture”. The “hot air, cold air” metaphor, anticipating that “sparks might fly”, has headed off fear: “It allows me to stand strong in my culture, and Steve in his, and to see what happens,” said Tim Newth, co-artisic director from Tracks. 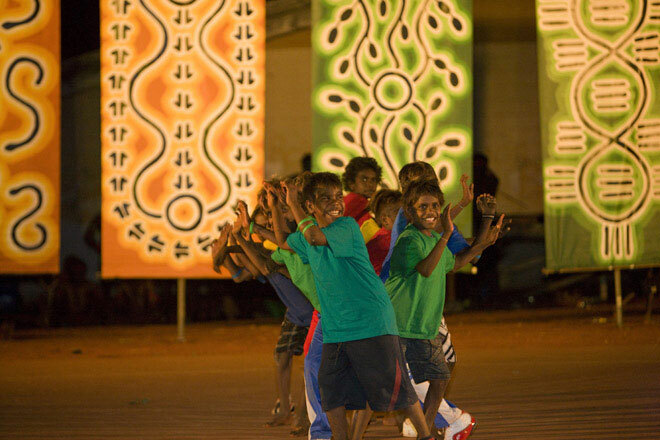 The photographs of the last Milpirri, from 2009, included some of boys doing break dancing, in front of a striking backdrop of banners painted with traditional story-telling motifs. The banners were not just “things that are good to look at”, said Mr Patrick, they are “things that are supposed to talk back to us”, reinforcing the Warlpiri sense of self. He represented this with a schematic diagram of the Southern Cross, with the land in the centre, law and language at its northern and southern points, ceremony and skin names at its western and eastern points. A “skin name” is much more than a name, he explained: “It is the place where you see yourself starting off on your journey in life.” If you are someone “with your head in the clouds and your feet on the ground”, you are someone “who exists”. Not to know your place is to be “just a wanderer”. The boys doing break dancing might seem to be wandering in a global culture, but he said their dance was based on a traditional story: “It might seem to be hip-hop but we are trying to interpret it in our own way”. He gave other examples of youthful fashions in Lajamanu – coloured wrist bands, even coloured plaster casts for footy players who’ve broken their arm – reflecting the wearer’s moiety … the winds of change. The history of funding for the festival reflects strengthening local support and ownership. Earlier funding came from “a long way away” through Tracks (funded by the Australia Council and the NT Government) and Rio Tinto, said Mr Newth. Now the funding is more local, with the store making a “major” contribution, as is Newmont Mine and GMAAAC (Granites Mines Affected Areas Aboriginal Corporation). The Tracks website also lists as sponsors the Central Desert Shire, the Northern Tanami IPA (Indigenous Protected Area), Southern Cross Television, and the National Institute for Experimental Art (which organised this week’s forum, an arm of UNSW’s College of Fine Art). Photos, top and bottom, Milpirri Festival, 2009 by Peter Eve.